"Hilary Tait Norod paints wild psychological dramas, dancing in and out of abstraction. You’ll find familiar private places: a bed, curtains, a floating chest of drawers, and among these cozy attachments: vast lurching places, unrecognizable, but emotionally precise dwellings of the mind. They’re the silent conversations you have with yourself before falling asleep. Looking at her paintings feels like putting on goggles and seeing the architecture of the psyche fill the empty space around us..."
Showcasing at the Bromfield Gallery are artists Hilary Tait Norod, Kate Benson, Adam Hinterlang, and Haley Harris. The show offers a variety of different styles and visuals to capture anyone’s attention with different mediums. For more information on the show, visit Bromfield Gallery‘s site! ​Hilary Tait Norod, a talented up and coming artist with whom I collaborate in theWebster Art Project told me about a charitable endeavor she is supporting called Art in Giving. The foundation, based in Boston’s Fort Point neighborhood, raises funds for childhood cancer research. More than 60 artists and galleries participate in Art in Giving, donating up to 50 percent of the proceeds from the sale of art to The Rachel Molly Markoff Foundation. Its mission is dedicated to pediatric cancer research and programs to help families cope with childhood cancer. General commentary, often with a regional focus. Overseen by Robert Whitcomb. A mixed-media painting of HILARY TAIT NOROD in her “Couplings” show at Galatea Fine Art, Boston, through Jan. 31. ..."Hilary Tait Norod, is an artist in her late 20's who recently moved back to the East Coast. Of course I clicked over to her website to have a look. I was drawn to her white abstract paintings. The White Series began as a challenge—with the exception of the black outlines, all the colors on the canvas have been mixed with different ratios of white paint. 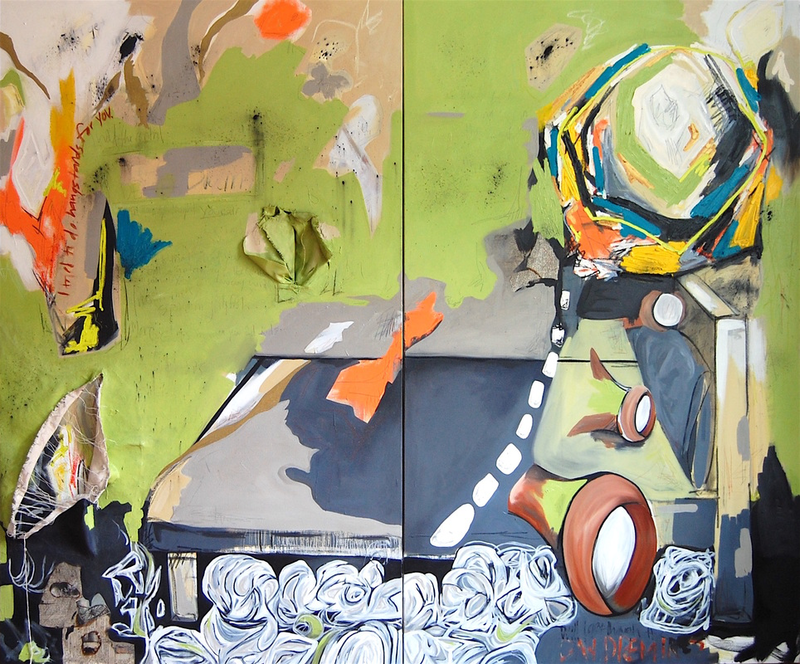 The shapes in the compositions develop from through layering the paint and other materials on the canvas. David Webster of Webster & Company and I have collaborated on a exhibition called #WebsterArtProject. I brought together 21 artists with ties to New England from whom Mr. Webster chose over 80 artworks. The pieces I chose, along with some others, are on display and on sale through April 30, 2016 at Webster & Company showroom at the Boston Design Center. In the exhibition a sense of identity is at play. "Couplings" will ignite questions of our own identity within the relationships we value most. Norod presents a series of mixed media paintings developed from an interactive study of couples. Interviews of these couples were conducted and documented by video, email, or written letter. Norod immersed herself in the dialogues by exploring the intricacies of interpersonal relationships.